1 All the living things and nonliving things in a particular area make up an ecosystem. One very special ecosystem in the United States is the Florida Everglades. This wetland biome or ecosystem was formed by the Kissimmee River flowing into Lake Okeechobee and spilling southward over its banks, forming the broad Everglades wetlands. The water may only be a few inches deep, but it covers areas as wide as fifty miles. 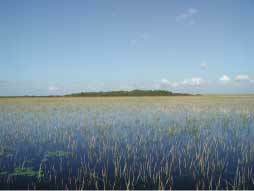 2 The Seminole Indians called the Everglades "grassy water." Mostly what you see in the Everglades is saw grass. In a few places, trees grow where the land is slightly higher and drier. Water can be seen among the grasses. This area has the richest assortment of plants, animals, fish, snakes, amphibians, and insects found in the continental United States. Perhaps the most famous resident of the Everglades is the alligator. 3 Any changes in this delicate community affect all the different animals living there. The study of how living things interact with one another and with their environment is called ecology. 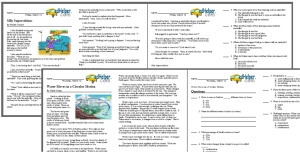 Ecologists, scientists who study ecology, look at how all the living and nonliving factors in an ecosystem are related.